A carousel horse, also sometimes called a merry-go-round horse, is a full-sized horse made of wood, plastic, fiberglass, or some other material. It's important to know that "full size" means the carousel horse is a size that is rideable by children and/or average-sized adults, but that's it's not necessarily as large as a real horse. Carousel horses are incredibly popular worldwide as part of an amusement park ride known as a carousel or merry-go-round. However, they're also popular by themselves. Below are full size, new and used, carousel horses for sale on eBay. For more information about carousels and carousel horses, please scroll down beneath the items for sale. You might also like: Musical carousel horses. Below: A beautiful, full size carousel horse on a carousel. How big is "full size?" Sizes among full-sized carousel horses do vary...sometimes a lot. Loosely defined "full size" usually means a carousel horse the average adult can sit on and not feel like their size is overwhelming the carousel horse. However, some sellers might feel that a smaller carousel intended only for children can be considered full size, too. Make sure you know the size - in actual measurements - of any carousel horse you might be interested in. What is the carousel horse made of? Is it a recreation of a carousel horse, or was it at one time part of a carousel and now it's been removed? What condition is it in? Be sure to thoroughly read the seller's description and look closely at the photos. Do you receive anything in addition to the carousel horse? For example, does it come with a stand? Don't assume you are receiving anything with the carousel horse, even if it's shown in the photos. Make sure you read the seller's description to know what you are, and are not, receiving with your purchase. Where is the carousel horse located? Will the seller ship it, or do you have to pick it up? If the seller will ship it, what will the shipping charges be? A carousel, or merry-go-round, is a popular ride found in amusements parks all across the world. Carousels have a large, circular-shaped platform that turns in a circle and holds seats for riders. While a few of the seats are benches, most of them are horses with an occasional tiger, zebra, pig, or other animal also included. The horses and other animals on a carousel are large enough to hold a child or adult, and are mounted on poles that run vertically from the floor of the platform to the top. 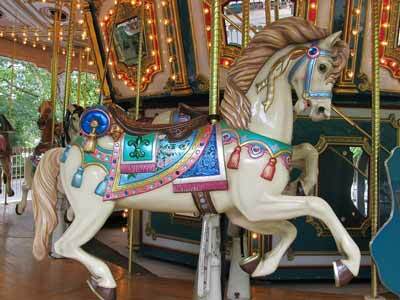 The carousel horse (or other animal) moves up and down the pole as it travels around in a circle while music plays. The poles also provide convenient handholds for the riders. Carousel horses are usually quite ornate with vivid colors and carved-in or molded-in accessories such as saddles, pads, bridles, cinches, breast collars, flowers, ribbons, and more. The designs are usually quite eye-catching with varying degrees of detail. The horses are often depicted in dramatic poses, galloping at top speed with fiery expressions on their faces. Children and adults alike love to ride carousel horses. Below: A beautifully ornate carousel horse with roses on the breast collar, a blue bridle and saddle pad, and an angel's face behind the saddle. From a carousel in Roger Williams Park in Providence, Rhode Island. According the Hanau Carousel page (<<< this link will open in a new window) on the National Carousel Association website, the oldest known carousel in the world is located in Wilhelmsbad Park in Hanau, Germany. Construction on the carousel was completed in 1780. It originally had two chariots with horses and two individual riding horses, but was rebuilt in 1882 to have four chariots, each with two horses, and two pair of spring mounted riding horses. 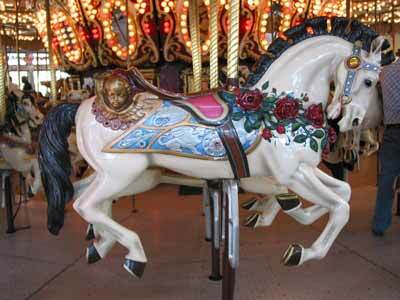 A musical carousel horse is a smaller - usually much smaller - recreation of a full size carousel horse. Usually only a few inches tall they are made, often with a high degree of detail, to resemble full-size carousel horses. 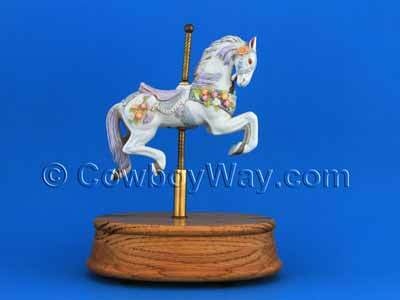 Below: This carousel horse is 9 inches tall from the bottom of the base to the top of the pole. When wound it plays "The Loneliest Night Of The Year" as the horse rises up and down the pole. The horse's dramatic pose, fiery expression, and ornamentation with saddle, bridle, flowers, and flowing ribbon (at the top of the bridle) strongly resemble a full-sized carousel horse.